In the last article, I discussed the importance of the rider’s natural aids in communicating with the horse. This time, I would like to share with you a simple exercise to help you improve the use of your aids: your seat, leg, and hands. 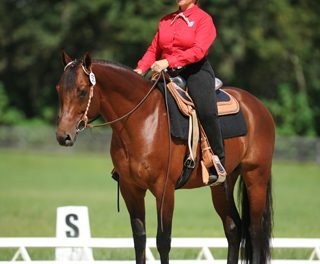 To do this exercise, you will need a large area, such as an arena or large pasture. Since we are concentrating on improving the rider, this exercise should be done using a horse that has basic understanding of the rider’s aids. The pattern for this exercise uses a large circle that has two smaller circles inside it. If you think of the large circle as a clock face, then the smaller circles inside it will be done at both the three and nine o’clock positions. During the exercise, keep the horse’s body positioned straight on these circles. This means that his body is slightly bent or arced to follow the circular track. A diagram of this pattern is shown in my “Dressage Principles for the Western and English Horse and Rider, Aids Communications,” which is available on my website. With the horse properly tacked and warmed up, start by asking him to walk forward on a large circle to the right. 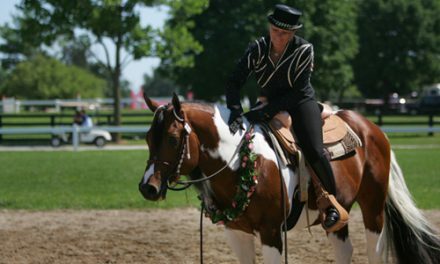 Communicate your request for the horse to move forward by using the aids together in the proper sequence. The first aid used is the seat. 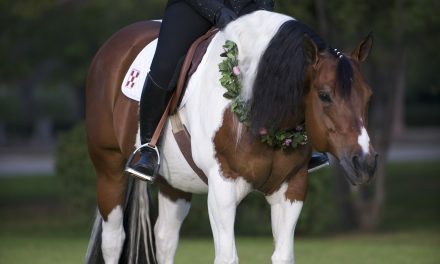 The rider’s shoulders are positioned slightly back so that her seat puts more weight in the saddle as her hips follow the horse’s movement. The leg aids follow with a light pressure to ask the horse to move forward. Finally, the hands encourage forward movement as the fingers open slightly on the reins to allow the horse the freedom of movement. The sequence is seat, legs, and hands. Once you establish a walk, continue on the large circle. As you arrive at the three o’clock position, make a smaller circle to the right within the large circle. We will use this smaller circle to prepare for a transition, which is a change from one gait to another or speed within a gait. As you complete the smaller circle and come back to the large circle, prepare to make a transition to an extended walk. Do this by putting more weight in your seat, following this movement with your hips while lightly squeezing with the legs and opening your fingers to let the horse increase his gait. Continue the extended walk on the large circle. When you arrive at the nine o’clock position on the large circle, prepare for a downward transition to a slower walk. Turning the horse onto the smaller circle will naturally tend to slow his speed. Ask for a downward transition by decreasing the weight in your seat and decreasing the movement of your hips following the horse’s movement and by decreasing and relaxing your leg aids. If necessary, slightly close the fingers on the reins. The horse should slow his gait in reaction to this communication. As you complete the small circle and approach the large circle again, prepare to ask your horse for an upward transition to a jog or trot. Time the communication so that your horse will be jogging or trotting as he comes back onto the large circle. The aids communications for this upward transition is the same as we used for the transition from slow to extended walk: seat-legs-hands. While placing more weight in your seat, move your hips forward to follow the horse’s movement as you lightly apply leg pressure. Remember to open the fingers to allow the horse the freedom to move forward. If you do not get a response, continue on a larger turn and repeat the aids sequence to ask for the upward transition. Keep the horse jogging or trotting on the large circle. Change directions to track left. We will use this direction to work on downward transition. Continue the jog/trot around the circle until you arrive at the three o’clock position. Once again follow the smaller circle and prepare for a downward transition to the walk. As you start to close the smaller circle, apply more weight in your seat, decrease hip movement, keep legs on contact but not squeezing, and lightly close your fingers on the reins. The horse should respond by giving you a downward transition to a walk. Continue walking on the large circle. As you approach the nine o’clock position, enter the smaller circle at the walk. As you begin to close the circle, ask for an upward transition to an extended walk by applying more weight with the seat, following with the hips, squeezing lightly with the legs, and opening the fingers. When you are on the larger circle again, continue an extended walk to the three o’clock position. As you enter the small circle at three o’clock, prepare for a downward transition to a walk. Keep your seat working lighter, leg lighter in response, and let the horse come back to his natural walk within the small circle. This time, before returning to the large circle, ask for an upward transition within the small circle. Remember the aids sequence: 1) increase weight in the seat, follow with the hips, 2) lightly squeeze with the legs, and 3) open the fingers to allow forward movement. Time your aids communication so that you are jogging or trotting by the time you are back on the large circle. Jog/trot one entire large circle to the left. Gradually make a large, wide figure “8” turn so that you are tracking to the right. On the large circle, prepare to extend the jog by applying more weight in your seat. Continue following the motion with your hips. Be prepared because the increased speed will make this gait more bouncy to follow. The legs still stay on contact with a light squeeze to support forward movement. Make at least one large circle at the extended jog/trot. When you are ready, use one of the smaller circles to ask for a downward transition to the walk. I will not repeat the sequence of aids to use since we have already covered it. Reverse directions and repeat this part of the exercise. As you do this exercise, you probably will discover that you need very little, if any, pressure on the reins. The seat and leg aids do most of the communicating. Ultimately, your goal should be that the reins become your most passive aids for all riding. I really like using this exercise for several reasons. The circle is a great pattern for training the horse and the rider. The smaller circles help the horse with downward transitions because he will naturally slow down on them. On the other hand, moving onto the larger circle encourages forward movement. The circles also give the rider some markers to help time the upward and downward transitions. Sometimes a horse does not respond to the rider’s seat and leg aids. If the horse does not respond to a light leg squeeze, first try moving the leg back slightly and reapply the aid, and then give the horse a little bump with the leg to get his attention if necessary. When you get a response to a leg aid from the horse, keep the legs on contact with the horse to maintain the request for forward movement. Always strive to use the lightest of aids! Another important aid to use to communicate with the horse is your voice. If you need more response to a request for an upward transition, add your voice by giving a cluck. A voice aid is sometimes all the extra communication that is necessary. In the next article we will add to this exercise. 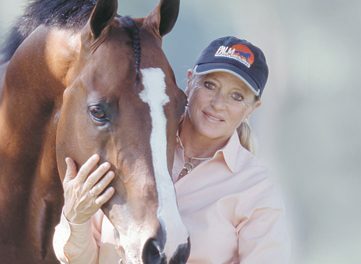 Lynn Palm teaches and coaches riders and horses. She also develops training and educational products. Learn more on Lynn’s Web site at www.lynnpalm.com.